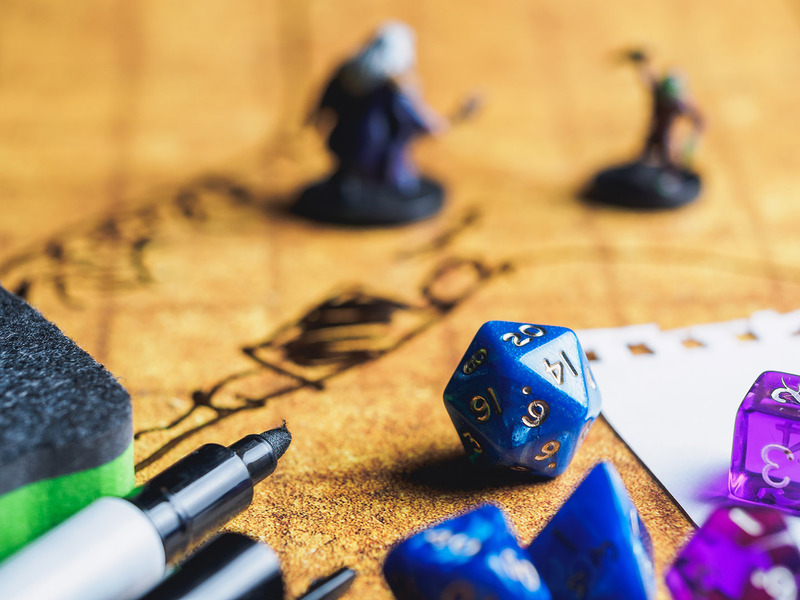 Thanks to the recent resurgence of 80s nostalgia (I’m looking at you, Stranger Things), the already incredibly popular tabletop game Dungeons and Dragons is attracting new players every day. If you yourself are new to the world of DnD, Bookmans is here to help. Some of our employees are, in fact, and this should be unsurprising, serious DnD gamers. As a devoted Dungeons and Dragons enthusiast myself, I am always happy to impart some wisdom to newbies. If you haven’t read Part One of this 3-part blog, catch up here. If you’re ready for some more tips and tricks, read on, adventurers! Carry a staff or pole if you want to stay alive in Dungeons and Dragons. It can be dropped or used in a fight, but they are also useful for poking things like Mimics, traps, or contagious things. You can try to extend jumps, help a falling player, and swat at things flying your way. A metal pole can last longer in fire or acid, and a staff may confuse enemies thinking you are a mage- or harmless old traveler. SO many uses for poles. Use your surroundings and random things in your possession. You’d be surprised how helpful the environment itself, or strange objects you find/carry can be. Aside from your DM possibly disguising an integral object or key as a useless item, random items like glass bottles or leather ties can be extremely useful. Try to think outside the box. Have you perhaps just angered a snooty merchant by walking into his steed? Is he about to have you arrested? Quickly convince the man you are capable of creating any and all perfumes, and you’ll make him a vial if he lets the issue slide. No joke, that happened. I/Althea was about to be arrested by guards and all I/she had were some weapons and a vial that smelled faintly of perfume. Have I mentioned how nuanced and detailed these worlds are? Do check for traps – ALL the time. The one time characters don’t check for traps, or they check everything BUT a seemingly harmless item, that’s when everyone gets doused in toxic sludge. Going hand in hand with checking for traps are ability checks. Ability checks are your character taking the time to look at their surroundings carefully or to determine how truthful someone is being to them. Since these are typically passive moments, they are easy to forget or overlook. A well-executed perception check can make a big difference in plot progression and character survival. Take the time to insight check your NPCs (non-player characters). NPCs are the general people living in the world you are adventuring in. They know the ins and outs of the city’s climate, politics, weird happenings. They are your best source for information. It’s another part of the game that is easy to forget about. New players especially tend to forget that in Dungeons and Dragons, they don’t need to go in a straight line. The DM has created an expansive world, so have fun in it. Take that side ally or chat with a random fisherman named Phill. Remember that everyone in the game has motivations. Your character, party members, NPCs, and the bad guys all have wants, needs, goals, and baggage. This is also where that insight check comes in handy. Knowing a person’s motivations is extremely helpful in predicting their actions or in negotiations. Take notes on any suspected or known motivations for characters- including your own. Reminding yourself of your characters motivations helps make choices for them easier. SO many notes. As the story and world build, its imperative that both the DM and the characters keep strong notes. Notes are not only what remind you of your current gear, but they are scraps of information you pick up. Flashes of an idea or important information may be discovered during a seemingly routine conversation, or the party may be exploring and need to remember to check a spot later. These nitty-gritty details are not always in the recaps and they are life savers. Recaps are a summary of the last game and are crucial since sometimes life happens and games are skipped or players miss a night. They remind or catch up players as to what happened. They are also an epic log of your adventure which one day you may want to reminisce on. This is especially important for DMs, but it’s handy for players too. Keep a list of names handy. DMs are always needing names for the random people your characters meet and befriend. Yet, it may surprise you how often you’ll need a name for an old friend, an alias, or the new horse you buy. There are still plenty more tips and tricks to come as we wrap up in Part Three, so check back in with Bookmans soon! Until then, play on, and be sure to check your local Bookmans store for all your Dungeons and Dragons needs!